HomeGold IRA BlogCurrencyWhat Actually Happens When a Government “Prints Money”? What Actually Happens When a Government “Prints Money”? 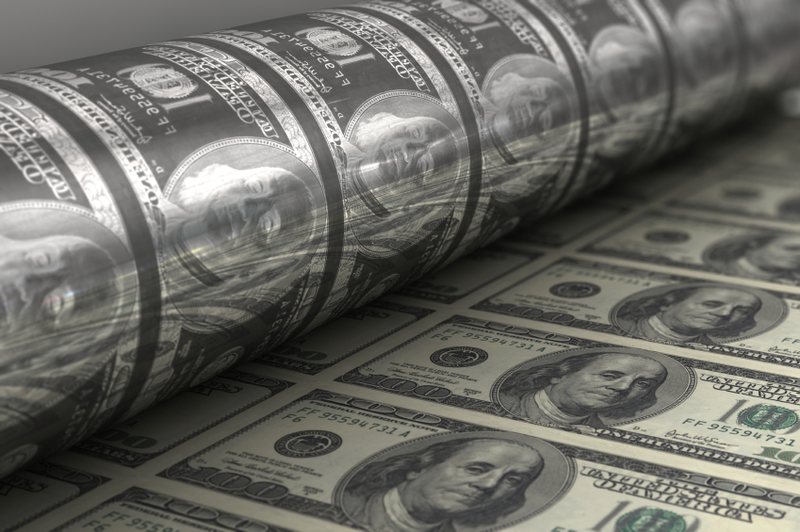 In economic discussion, you may often hear that a government is “printing money” and then picture sheets of hundred dollar bills coming off a printing press. However, most often this is not what actually takes place when a government adds to the monetary supply. Money creation in modern economies usually involves creating money that is not physical. Central banks do not even have the power to print physical currency or mint coins – the Treasury department does. So what exactly happens then? To make the explanation simpler, below are some terms that you will need to know moving forward. In this article we will refer to the United States’ process of money creation, and keep it to the basic concepts needed to understand the bigger picture. commercial bank – Bank that provides services such as accepting deposits, making business loans, offering investment products, etc. Mostly deals with large corporations or businesses rather than individuals. Usually when the term printing money is used, it is referring to one of two processes for increasing money supply. In one process, the Fed buys financial assets (don’t worry too much about what these are, just think of them as large chunks of money not in physical form) from commercial banks. The money the Fed uses to buy these financial assets is created out of nowhere; it is not existing money that the Fed possesses. This gives commercial banks more money to lend to their customers, which pumps new money into the monetary supply. This is also referred to as quantitative easing (QE). In another process, the Fed simply extends a loan to a commercial bank, again using money that comes out of thin air. The commercial bank then keeps a required fraction (percentage) of the loan money as a deposit, then extends loans to other commercial banks using the remainder of the loan money. These commercial banks that receive the loans from other commercial banks then do the same thing – keep a required fraction of the loan sum as a deposit and then loan out the rest of the money as they please. These loans count as money, so therefore the money supply is increased. As you can see, no physical money is printed in either of these processes. Very little of the United States’ money supply is in the form of physical currency. Commercial banks may withdraw physical money from the central bank, which is simply changing the form of currency from electronic to paper. This paper money is what actually gets printed. Old soiled money can also be exchanged for crisper, cleaner new paper money. Dollars that are printed are essentially just paper before any value is assigned to them. To explain what printing money does to the dollar, we will use an analogy. Take yourself as an example. You are unique and are worth something. Now let’s say I cloned you a million times. Now there are a million of you, all exactly the same, wandering around. How much is each of you worth now? A lot less than what you were worth before you were cloned, because there are more of you, you are no longer unique, and you are easier to attain. Now take that analogy and replace yourself with a dollar. This is inflation, and this is why inflation devalues the U.S. dollar. As of January of this year, the U.S. money supply stands at $11,010 billion. What’s gold got to do with it? Why does gold make a great hedge against inflation? There are many reasons, but for the sake of relevancy to this article, you cannot print gold. Gold is a physical, tangible asset that you cannot make appear out of thin air like the Fed does with the U.S. dollar. Therefore, it is a lot more difficult for gold to devalue. Due to inflation, 100 U.S. dollars in the year 2000 would only buy you $82 worth of groceries in 2013, while $100 in gold in 2000 would buy you $470 in groceries in 2013. One of your most important financial assets is your retirement account. If your 401(k) or IRA consists only of U.S. dollars, it has likely already lost value and will continue to do so in the future. Investing some of your retirement funds in gold can offer protection against the dollar’s devaluation. Consider opening up a Gold IRA with American Bullion to take action against what was discussed in this article. Call today at 1-800-326-9598 or request your Free Gold Guide.